What inspired the new look and haircut? SB A wig, whiskey, cheap furs, and stripper heels. [laughs] When I had my old hair, I bought this crappy wig for twenty dollars and would go out on weekends dressed like the call girl in Eyes Wide Shut. Life was so much more fun in that look...so when I left my previous agency, I figured why not? I told my agent what I wanted to do and he asked Jimmy Paul to direct the cut. Best thing I've done in years. Here's a pic of the look below that inspired the whole thing. In the past, it's often been scary for models to have more of a statement look. Were you nervous at all? SB Well, I had already done the rounds as the girl next door. It worked and I made some good money, but you hit a point where that just becomes bland. I think, in 2016, creative people really want to work with others who are creative with themselves. They want to experiment and work with talent that can carry the brand. Alessandro Michele and Hedi Slimane really have that down, and it plays true when you look at the sales. SB It's been great—mixed, of course. You lose some of your commercial clients, but higher-end houses start to look at you. It's risky business, but I'm really happy with where I'm going. I mean, I'm being interviewed by V Magazine, right? SB Seattle dope fiend in 1994? Faded blacks and stretched knits that fall off the bones like they've been wet and air-dried too many times. What is your process getting dressed in the morning? Not going to lie—I wear the same thing two days in a row a lot. Go ahead and throw up if you'd like [laughs] I can be a little crumby sometimes, but it works. My clothes are loose and look better worn and I try to spend as little time as possible choosing outfits. SB Yup, apply neosporin to nose and cheeks; buy a clothing steamer and steam your face at night with the neosporin on. Works amazing! SB Boring, but good vintage shopping. Lots of oldies live there who pass on and leave great stuff behind for awesome prices—morbid. What is your favorite part about living in New York? SB Having a mouse run around a restaurant when you're eating. They're so CUTE! What's one of your most embarrassing fashion moments? If you could bring back any historical fashion trend (corsets, jellies, etc), what would it be? SB Kilts! Im designing one in this new line that will be unisex. What's on your Netflix queue right now? SB HOUSE OF CARDS! 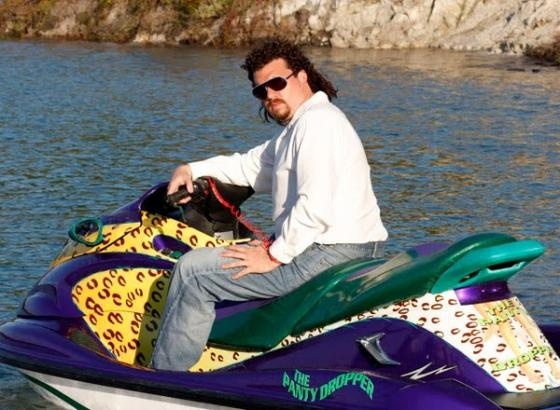 Also, not on Netflix but have you watched Eastbound and Down? Check out this Jet-ski! Did you find the modeling industry particularly challenging to break into? If you could give advice to aspiring models now, what would you tell them? SB Dude, I've said this a million times, and it will stand true forever: Number one, develop healthy habits early on. You don't want to be fighting off choco-binges before a shoot. Number two, collect a range of friends who can elevate you. Power is the people you collect. A million great ideas mean nothing if you don't have the assets and support to execute them. SB Alessandro Michele and Tom Ford. Alessandro has reinvented Gucci (like Tom before him) and has changed fashion. There's no denying it. Walk into any retailer and all the bags and clothing have patches now. It's wild. SB Honestly, every model wants to transition out. I'm designing this really awesome cashmere line that's going to be out for F/W 2016. Yay! I've got some great film roles. I've really gotten my focus together and established a solid friend group. Really can't wait to show it all to the world.